With one of the Baker Street Irregulars pointing out to me that my literary agent, Sir Arthur Conan Doyle, has been honoured by appearing on a set of Royal Mail stamps issued this week to celebrate Eminent Britons, I thought it a good idea to mention the set of Sherlock Holmes stamps issued by the Royal Mail in 1993. This set of five stamps depicted five stories from the Canon: The Reigate Squire, The Hound of the Baskervilles, The Six Napoleons, The Greek Interpreter and The Final Problem. There is a little puzzle hidden within these stamps – my literary agent’s last name “DOYLE” is hidden, one letter on each stamp. Can you find them? To make it easier go to the Philatelic Sherlock Holmes where you’ll find a much larger set of images if you go to the detailed page. 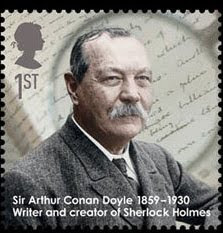 You will also find at the above website many other stamps relating to my good friends Holmes and Doyle.